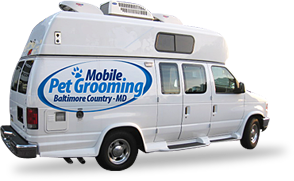 Mobile Pet Grooming has been in business for over 12 years serving Maryland and DC area. At Mobile Pet Grooming, you'll find the most caring professionals in the industry. All of our PET Stylists participate in a comprehensive training program that certifies them in all areas of customer care and quality, which includes greeting pet and parents; understanding their special needs and offering solutions. Mobile Pet Grooming utilizes the latest in mobile grooming technology, to ensure your best friend’s visit with us is a safe and happy experience. Our self-contained mobile unit requires nothing from you except a place to park and a dog or cat to love. We pride ourselves on our customers’ complete satisfaction, and will accommodate the special needs of each client on an individual basis. We provide the highest quality care, products and personal service you and your pet deserve… We treat your pet like a star! Contact Us Today. Here's just a sample of what happy clients (and their pets!) are saying about Mobile Pet Grooming! "Mobile Pet Grooming has been my sweet cocker Annie's groomer for several years – They truly love their little customers and they trust him. Annie will not let me groom her so she truly looks like a different dog when she comes back in. She looks, smells and even acts so pleased with herself! I would never let anyone else groom my little blond watch dog –Good job Mobile Pet Grooming. We Love You." "
"Mobile Pet Grooming, has been a lifesaver. In the past Bruno and Seamus our miniature schnauzers, hated going to the groomers. Mobile Pet Grooming takes such good care with them and it shows. They love to get groomed now and they show no signs of being nervous or upset. They look great every session and exactly like a miniature schnauzer should look! They are prompt and their price is reasonable. We highly recommend Mobile Pet Grooming." "Mobile Pet Grooming comes to your home and provides quality grooming to dogs. They arrive with the salon, a large van complete with all the amenities to accomplish his craft. Our Gidget looks so adorable in about one hour! They are very responsive and timely, and his work is excellent! Give them a try, you will not regret it." "Mobile Pet Grooming has been my sweet cocker Annie's groomer for several years – They truly love their little customers and they trust him. Annie will not let me groom her so she truly looks like a different dog when she comes back in. She looks, smells and even acts so pleased with herself! I would never let anyone else groom my little blond watch dog –Good job Mobile Pet Grooming. We Love You."